Just about everyone loves coffee which makes it perfect for holiday gifting. Check out these 5 ways to gift coffee for the holidays for a gift that won’t disappoint! I recently had the chance to try McCafé packaged coffee and I couldn’t say no since one of my favorite treats to myself is to stop at McDonald’s for a coffee. Since I work from home, I don’t go out every day and find it a little silly to go out juuuust for coffee, so I love the ability to make some of my favorite flavors at home with coffee I can buy at the grocery store. Plus, some days you want a stronger coffee then other days you want it super sweet and creamy. 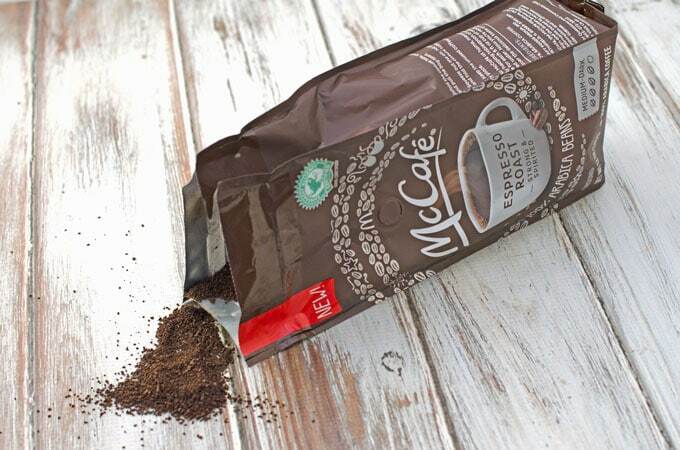 McCafé packaged coffee is made with 100% Arabica beans and comes in seven different varieties such as Breakfast Blend, Espresso Roast, Hazelnut, French Vanilla, and more so you’ll never get bored. Many of the varieties come in both ground coffee and K-Cups which I appreciate so that I can make single cups for myself during the week or a whole pot for both of us on the weekend. 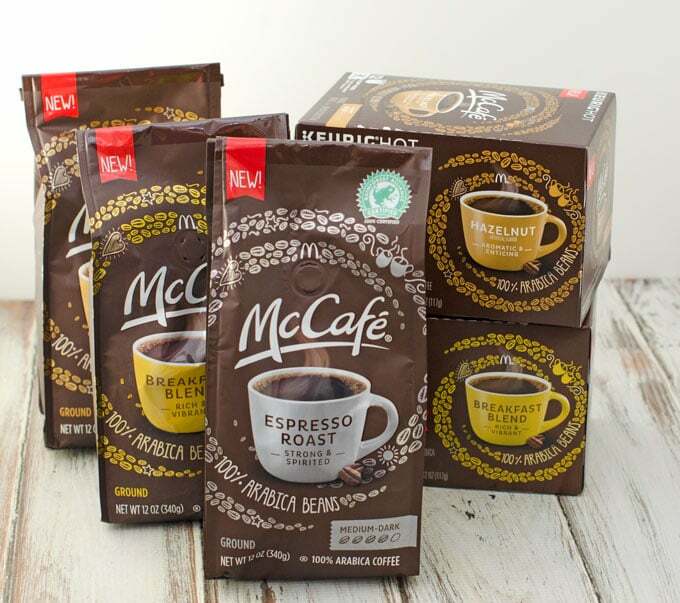 McCafé packaged coffee is also pretty reasonably priced with average prices being $7.49 for 12oz ground coffees, $8.39 for 12 count K-Cups, and $11.99 for 18 count K-Cups. 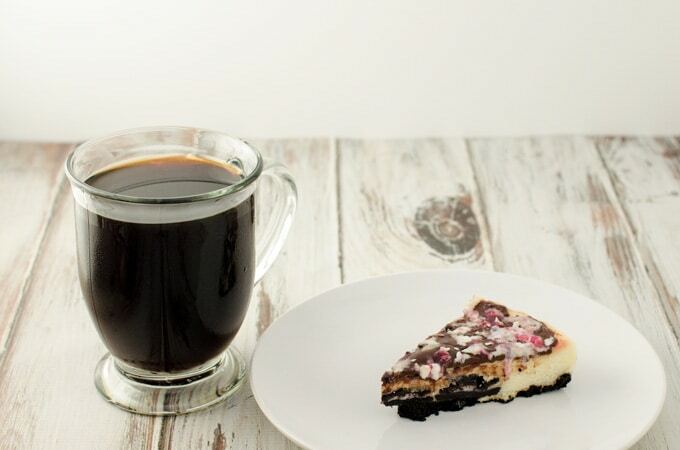 I seem to drink a lot more coffee around the holidays, especially since it goes so well with many holiday goodies like this peppermint cheesecake. The holidays are always busy, but I always have coffee and a sweet holiday treat on hand to be able to enjoy with friends and loved ones that have a moment to stop by. I usually don’t like overly strong coffee, but I have to admit I keep going back to the Espresso Roast. It has a nice robust flavor, but is very smooth and keeps me going for all the holiday chores I need to get done. It also has a really awesome coffee smell. Yes, I am that weird one that loves the smell of coffee and takes a big sniff of the coffee every time I open the bag. I’m not the only one, right? The Espresso Roast smells so good I think I’d even have it as an air freshener in my office. Anyway, since I know there are many fellow coffee lovers out there, and we’re all looking for new gift ideas, I thought I’d share some of my favorite ways to gift coffee for the holidays whether your budget is low or high. Happy Holidays! 1. Make a small gift set with a mug. Everyone has coffee mugs, but I never mind getting more because they inevitably get broken or taken to the office. Plus, with as much coffee and tea we drink, we always can use one more. So, for my fellow coffee lovers, I love to get a mug that fits their personality and fill it with a bag of McCafé packaged coffee, a chocolate spoon, and some cookies or biscotti. Then put it all into a cellophane bag and tie with a pretty bow and you have a wonderful gift they’re sure to love. 2. Gift a bag with their favorite sweet treats. Nothing goes better with coffee than a bite of a sweet treat. I love packing a pretty bowl with a bag of McCafé packaged coffee or a few K-Cups and surrounding them with some baked goodies like gingerbread, cookies, or brownies. Again, pack it all together in a cellophane bag with a festive bow and you have a beautiful gift straight from the heart. 3. Include in a themed gift basket. I really love both giving and receiving gift baskets. It’s a great way to treat loved ones to a variety of special little items they’d normally not treat themselves to. One of my favorite themes is a breakfast gift basket with things like pancake or waffle mix, syrup, small jars of jams or jellies, citrus, and, of course, some McCafé packaged coffee. 4. Make a jar of flavored coffee to give. A really nice frugal gift idea for the coffee lover is to make your own flavored coffees. All you need is a mason jar, some McCafé packaged coffee, and a powdered coffee creamer. Peppermint creamer with breakfast blend or gingerbread creamer with the hazelnut coffee are great combos for the holidays! 5. Gift with a coffee maker. If you’re buying a gift for someone that recently moved out on their own, got married, or you know could use a new coffee maker, gifting a coffee maker with some bags of McCafé packaged coffee would be an awesome gift to ensure they start their day off right. There are a ton of inexpensive good quality coffee makers available today. Even newer K-Cup machines are available for around $100 at warehouse stores this time of year. For more information about McCafé packaged coffee be sure to follow McCafé on Twitter. What are some of your favorite ways to gift coffee for the holidays?